TartanTerrace: Don't Tell My Husband. I've always loved Welsh dressers. I had one in a former life, but that was then and this is now. I've been looking for another one ever since. Welsh dressers have been around for hundreds of years in the U.K. Primarily used in the kitchen for purely utilitarian purposes, Welsh dressers stored food and housed crockery. But gradually the function of the dresser changed. It became a perfect place to display the best dinnerware, and it moved from the kitchen to the dining room. As you can see, this is a great place to display my blue and white porcelains, family photos, books, etc. We had a little dinner party on the Fourth, and the flowers are still hanging on. Thank goodness for grocery store flowers! So today I had to show up for jury duty. After waiting for two and a half hours, we were told that we could go home. After all of the trauma of getting to the courthouse in downtown Dallas at the crack of dawn and then sitting for HOURS, I decided I needed a little retail therapy. ANYWAYS (as my daughter used to say), guess what I happened upon in the back of an old building? I can't tell you how excited I was! It's 19th century and I think it has lots of character. It definitely needs a little work. For example, the knobs aren't the original and will have to be replaced. The finish is pretty banged up but nothing a little wax can't fix. All in all, I think it's a great find. I have absolutely no place in my house to put it. But that's okay, because I can always find a place for something I really like. After I bought it, the shop owner agreed to keep it at the shop and do a few repairs. That will give me time to figure out how to break the news to my sweet, long-suffering husband that we have yet another piece of furniture for which we have no room. In the meantime, don't tell him. Such an awesome piece! I know ou will find the perfect place. Foyer? I can't wait to see where it will end up & how it will be styled. I already have several places in mind to put it. I guess that how I style it will depend on where it ends up. I'll post pics as the story unfolds! It's really true that my husband doesn't know about it since he doesn't read my blog. He's in for a big surprise! What a great find! Love all of your blue & white! Thanks, Jennifer. I'm so excited about your new house. I love the front entryway with the beautiful stairway. I see lots of great posts ahead! I have the perfect spot for it. My house! Great idea! Then we only have to explain it to Paco instead of you-know-who. I have to know where you found it! I love to poke around in some of the shops on Riverfront and Hi-Line. I found it at "Lots of Furniture Antiques, Inc." It's at 910 N. Riverfront, 75207. Website is www.lotsoffurniture.com. You have to do some hunting, but that's part of the fun. Beware of all of the cats; I counted seven when I was there! I have a piece very similar to your recent purchase. I love love love this piece and use it in my dining room. I can send you a photo of mine if you are interested. 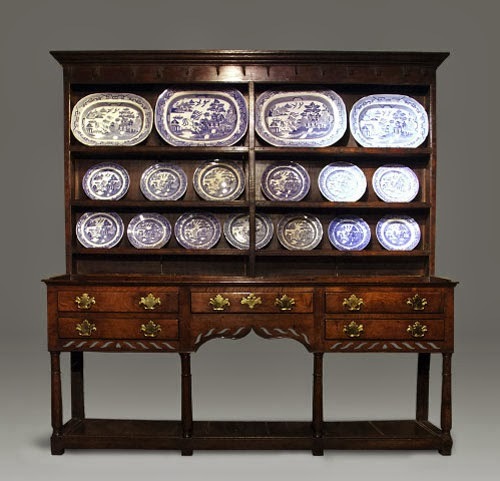 Yes, please send a picture of your Welsh dresser. I'd love to see it! And... Have you told him yet?!?! Nope, and you better not tell him either! I sent you an email attaching a photo of my piece. I just love it! What a find! It reminds me of one I saw on the British Antiques Roadshow. The commentator said the top shelf was "lower" to allow for platters to be stored vertically instead of horizontally, and that it came from a very specific part of the country, but for the life of me I don't remember what part. :( Sorry. Anyway...have you told your husband yet? Babs - Thanks for the info. I'll have to do some more research on the history of dressers. No, my husband still doesn't know. He always tells me that he reads my blog, but this is proof that he doesn't. Busted! All of the devices we are beep.com/ mosting likely to cover included the most up to date in high Title technology as well as dependable lcd displays, Best Water Softeners Reviews – 3 Best Water Conditioners making operation of the systems effortless, in Fleck Water Softener addition to making them extra Best Fleck Water Softener energy efficient.